The Olympics are changing and British freestyle BMX rider Alex Coleborn could be the man to lead Team GB into a new ‘urban’ era for the Games. Tokyo 2020 will be the first senior Olympics in history to feature events like 3v3 basketball, sport climbing, skateboarding and freestyle BMX. Given ‘breaking’ and roller speed-skating debuted at the recent Youth Olympics more Urban Park events are likely to follow as International Olympic Committee (IOC) attempts to boost the Games’ youth appeal and thus safeguard its future. However, Britain is desperately short of genuine medal contenders in all of these new sports – with Jersey-born Coleborn, who claimed silver at the first-ever UCI Urban Cycling World Championships last year – a rare exception. “When I was a kid I’d watch the X Games and think ‘that’s where I want to go’ and the Olympics seemed so far off, but now BMX is in, it’s insane,” says Coleborn. Before his bid for gold at this year’s World Championships in Chengdu, China, BBC Sport meets Coleborn and some of his GB team-mates who are targeting Tokyo 2020. “Freestyle riding is just freedom,” Coleborn says. Unlike ‘quickest wins’ BMX Supercross, which has been in the Olympics since 2008, in freestyle BMX athletes are allowed two one-minute runs each to perform a series of tricks and techniques which are judged. Riders are assessed on the difficulty, originality, style, flow risk, amplitude (height) and execution of their tricks which helps determine the highest scores and event winners. Coleborn began riding at the age of 13 but facilities on the island of Jersey were limited at the time so he and his friends simply decided to build their own. “At the time we basically had nothing, so we’d all get the spade out and go building little mud jumps in fields and we played around really,” said Coleborn, who may never have progressed further without his father’s intervention. The rider moved to Corby in Northamptonshire and has been based at the ‘Adrenaline Alley’ facility for the best part of a decade. “I suppose it could have been hard leaving home at that age and moving to the UK, but I was just loving it,” he said. Coleborn’s skills have helped him gain more than 100,000 followers on Instagram, which has also led to several commercial sponsors deals. However, the rider has also endured the more challenging side of the sport. “You don’t want to think it, but in the back of your mind when you try a new trick is a ‘what if’,” Coleborn admits. 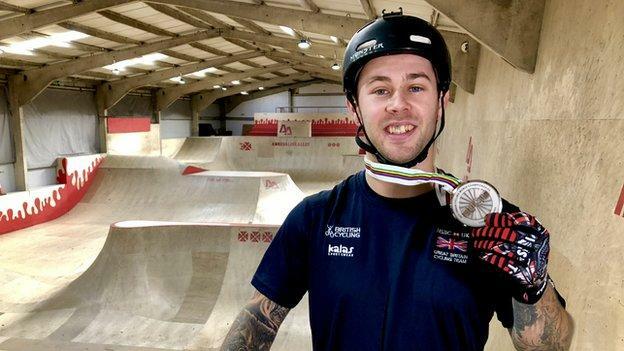 The 26-year-old showed he had fully recovered last year by claiming Britain’s first-ever urban cycling, freestyle BMX world silver medal which helped convince UK Sport to invest more than £1m in a British team heading towards Tokyo 2020. “It gives us the freedom to ride everyday and we know the physiotherapy is there when we need it,” he says. No Jersey athlete has ever won an Olympic medal in any sport and their last Olympian was swimmer Simon Militis at the Sydney 2000 Games. However, after his breakthrough World silver in 2017 Coleborn is now aiming to make further history. “It would mean so much to be at the first ever Olympics for [freestyle] BMX and being a Jersey boy it would be great to fly the flag,” he said. Coleborn describes his 2017 silver as “unbelievable” and says it would be “everything” to repeat that success or better it at this year’s event. The British team for this year’s World Championships features eight riders after Charlotte Worthington suffered a concussion in training and withdrew from the event. Izzy Burrell the youngest competitor at just 17, but Liverpool-based 20-year-old rising star talent Emma Finnegan is likely to be GB’s strongest female medal contender. “Representing GB in BMX freestyle wasn’t a thing when I started, especially for me and for women, but now we’ve been welcomed into the sport along with the guys I think it’s really great to be a part of,” she said.